Since 9/11, more than 240,000 women have fought in Iraq and Afghanistan—more than 140 have died there, and they currently make up fourteen percent of the total active-duty forces. Despite advances, today’s servicewomen are constantly pressed to prove themselves, to overcome challenges men never face, and to put the military mission ahead of all other aspects of their lives, particularly marriage and motherhood. In this groundbreaking, insider’s look at the women defending our nation, Tanya Biank brings to light the real issues—of femininity, belonging to an old boys’ club, veiled discrimination, dating, marriage problems, separation from children, questions about life goals, career trajectories, and self-worth—that servicewomen are facing by focusing on four individual stories. Brigadier General Angela Salinas, the Marine Corps’ first Hispanic female general, faces the challenge of commanding an all-male institution. Second Lieutenant Bergan Flanagan finds herself on the frontlines in Afghanistan, serving in the same military police company as her husband. As a marine drill instructor, Sergeant Amy Stokley demands the very best from the recruits at Parris Island. And Major Candice O’Brien deals with deployment to Afghanistan, with two young children and a strained marriage back home. Undaunted is the story of these courageous trailblazers—their struggles, sacrifices, and triumphs in the name of serving the country they love. "…provides a great perspective on some of the unique challenges female service members face. The book is respectful of the military while highlighting some of the less visible aspects of serving as a female service member in a predominantly male culture." "I salute these brave women. And I salute Tanya Biank for bringing their story to the rest of us. They make us proud." "Tanya Biank has done the nation a service with this clear-eyed account of women in uniform, edging ever closer to war." "With women now allowed to join the combat arms branches, this is an important behind-the-scenes book that provides a fresh perspective on the women who defend our nation. Biank follows the private struggles and career successes of four women -from a new lieutenant to a general officer - whose experiences reflect the opportunities and obstacles faced by female service members. She tells their stories with insight, sensitivity, and compassion. This book is a 'must read' for those of us who want to better understand our women who serve." "Undaunted contains fascinating multiple portraits of the real-life experiences of women in the military, from young enlisted women to a seasoned and celebrated general. Tanya Biank explores these lives with inside knowledge, compassion and wit. This important book reads like a novel, and as I read, I couldn't wait to see how these brave women's lives would unfold." military values of 'Honor, Courage, Commitment.'" "To many traditional men, especially those who have known the rigors of military service, the question often is, why would women want to take on this challenging life? By the end of Tanya Biank's fine book, Undaunted, the answer is clear: because they want to do it, and they can do it. In short, women have a right to achieve their fullest potential and pursue their dreams no less than men in any field. The four women the author traces demonstrate that when the will, the ability and love of country are there, gender makes no difference in a soldier, sailor or marine." —Joseph E. Persico, Author of Roosevelt's Centurions: FDR and the Commanders He Led to Victory in World War II"
"Tanya Biank's Undaunted is a fascinating, eye-opening account of the women in uniform who put their lives on the line every day for the sake of their nation." 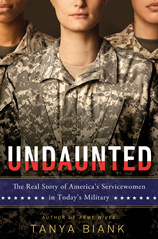 "Undaunted expertly captures the struggle women face in the rapidly changing 21st century military. Enlightening and engrossing, the book weaves in little known facts about the invaluable role women have played throughout the history of the Unites States military. If you have ever wondered what it takes for women service members to "be all they can be," you must read this book." "In her latest, Biank sheds light on women who serve in the armed forces. She closely follows the careers of four servicewomen between 2006 and 2011: Brig. Gen. Angela Salinas, the first Hispanic female general in the Marines; 2nd Lt. Bergan Flannigan, a platoon leader married to a man in the same military police company; Sgt. Amy Stokley, a drill instructor for the Marine Corps; and Maj. Candice O'Brien, an officer whose deployment to Afghanistan strains her marriage to a military husband with PTSD. Biank is a skilled biographer, providing contextual snapshots of America's military with each passing year. Her immersion in each woman's state of mind makes these stories read almost like a novel, and the clarity of detail, from cadet slang to the social politics on base, reveals the thoroughness of her research. Biank doesn't offer any groundbreaking conclusions—women are ever more prevalent in the military, but still face challenges in a hypermasculine environment—but these engaging glimpses into the life of military women are more than worth reading for their own sake." "Biank analyzes the increasingly important role played by women in the military. " 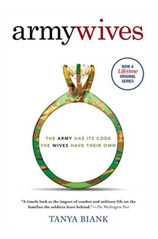 "The author, whose first book was developed into the popular TV series Army Wives, follows the military career of four women currently playing a vital role in today's integrated armed forces: Brig. Gen. Angela Salinas, the Marine's first Hispanic female general; 2nd Lt. Bergan Flanagan, a military policewoman in Afghanistan; Sgt. Amy Stokley, who drives recruits at Parris Island; and Maj. Candice O'Brien, who struggles through deployment to Afghanistan with a strained marriage and two children back at home. Biank shows forcefully how this commitment to service still runs up against sexism and prejudice. Three of the four served tours of duty in Iraq and Afghanistan, yet nonsensically, by law, women are still prevented from deployment in combat. Women in the armed forces train to the same standards of excellence as their male colleagues who qualify for combat, and they must maintain the same levels of physical fitness and endurance. In Iraq, when Stokley was a driver, her truck came under attack, and one of her passengers died. Flanagan lost her leg to a roadside booby trap when working to train the Afghan National Police. Biank follows the careers of the four individuals over time, as they advance in their chosen spheres. Salinas chose to continue to serve when she was told by a corporate headhunter that she "would not find what you have in the Marines here….You're not going to find loyalty or camaraderie here like you're used to." " An eye-opening account of a military in transition."